Author Todd M. Kuikka, a seasoned combat veteran, returned ''home'' to find it wasn't the same as he remembered. What or who changed? No one knows what it's like to return from hell more than those whose soles--and souls--are already scorched. Veterans face many obstacles and fight many battles during reintegration and after military service. They also struggle with many misconceptions and stigmas, which become severe stumbling blocks complicating civilian reentry. This comprehensive discussion guide reveals many of the barriers service members encounter when they return with honor but lose hope at home. 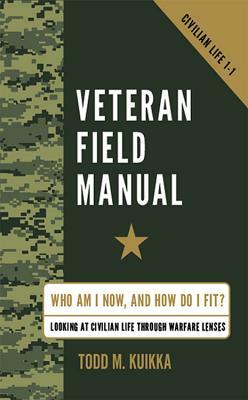 By highlighting veterans' strengths and encouraging them to use their military core values, the Veteran Field Manual helps veterans overcome hardships and place team, self, and family on a path to success in the aftermath of war.